Back in July, a couple of bloggers I follow (Ali at Heaven Ali and Lizzi at These Little Words) were reading Truman Capote’s A Capote Reader. I didn’t want to commit to reading such a big volume, but their posts did pique my interest in Capote’s short stories, hence my purchase of The Complete Stories. This collection consists of twenty stories written between 1943 and 1982, presented in chronological order. I’m not going to try to review each story in turn, but to give a sense of the themes and a little of what I thought of the collection as a whole. I love that quote: Sylvia’s anger at her situation, Estelle’s patronising tone. It conveys so much about the characters and their position. The Master Misery of the title is Mr. Revercomb, a man who buys dreams for money, stealing a tiny piece of an individual’s identity with every story. Sylvia starts selling her dreams, but as the story progresses she becomes increasingly unsettled, ultimately realising that she must reclaim what’s rightfully hers. In Miriam, another disquieting story, a lonely woman in her sixties befriends a young girl, Miriam, on a trip to the cinema. But when Miriam arrives at the woman’s apartment expecting to move in, events take a more sinister turn. Three or four of the stories towards the end of the collection seem to reflect aspects of Capote’s own childhood in Alabama. Born in New Orleans in 1924, Capote was ‘deserted by a too-young and sexually adventurous mother and a bounder of a father’ only to be raised by a collection of cousins and neighbours. (That quote comes from Reynolds Price’s introduction.) This experience appears to have left its mark on Capote as a sense of loneliness and difference, of not quite fitting in, inhabits these stories. Two of these – A Christmas Memory and Thanksgiving Visitor – are among my favourites from the collection, and both feature the relationship between a young boy, Buddy (possibly Capote) and his best friend and distant cousin, Miss Sook. Buddy’s cousin is ‘sixty-something,’ but as a result of a long illness in her youth, Miss Sook remains a child. A Christmas Memory tells of preparations for Christmas. Miss Sook and Buddy bake fruitcakes for all those who have shown them kindness during the year; they craft homemade decorations for the tree and presents for each other from materials squirreled away during the year. In Thanksgiving Visitor, Miss Sook attempts to heal the rift between Buddy and a boy who bullies him at school. Both stories are evocative, beautifully told and poignant, A Christmas Memory especially so. I really enjoyed Capote’s Complete Stories, and they made a welcome change between a run of deeper novels. Most of the stories were very good to excellent, although three or four in the collection drifted a little and didn’t quite manage to hold my attention. Still, that’s pretty good going for a complete set of shorts – I wouldn’t expect to click with each and every one. The Complete Stories is published in the UK by Penguin Classics. Source: personal copy. Book 3/20 in my #TBR20. This entry was posted in Book Reviews, Capote Truman and tagged #TBR20, Book Review, Fiction, Penguin Classics, Short Stories, Truman Capote, US on January 12, 2015 by JacquiWine. I still haven’t finished the whole of A Capote Reader I loved the stories though I didn’t have The Christmas memory in my edition and it’s one I want to read. It’s nice to have something to dip into every now and again and your Reader edition sounds perfect for that. You’d love A Christmas Memory, Ali. I think it’s my favourite story from the collection, beautifully poignant. Years ago I read In Cold Blood, that is the only thing that I ever read from Capote. I like the sound of way that the stories end. I find a bit of melancholy fascinating. I really liked the way these stories ended on a melancholy note. There’s a lot of sadness and loneliness here, and I can’t help but think this must be a reflection of Capote’s childhood. I must read In Cold Blood. I watched the Capote film over Christmas, the one that focuses on his approach to writing that book. Fascinating and disturbing stuff. I remember one of Heavenali’s posts. I’ve got the Capote Reader but have only read a few very short pieces so far. Your post puts me in the mood to pick it up again. There are no novellas in your collection, right? I’ particularly interested in The Grass harp and Breakfast at Tiffany’s. Since I often rea the beginning s of stories long before reading them I remeber thing the same as you — he writes terrific beginnings. Thanks, Caroline. I’m glad to hear my piece puts you in the mood to return to Capote. You’re right; this collection is just the short stories, no novellas. I’d like to reread Tiffany’s and wondered about getting the Reader edition, but I tend to prefer smaller, lighter books. I just find them more comfortable to hold! The beginnings are pretty memorable, aren’t they? He was good on endings too. They’re interesting from a technical perspective as he knew how to structure and pace a story. Same here. I have a coule of books I’d love to read but can’t hold them. This must sound weird for some people. The Capote Rpeader isn’t as bad as some others but it would be wonderful to have the individual novellas. I know what you mean. It’s my upper back that’s the problem, and holding a heavy or chunky book just exacerbates it. Good to hear that the Capote Reader isn’t too bad on that front. I think I’ll hold out for individual editions of Tiffany’s and his other books; the Penguin Classics editions are lovely. Good review, Jacqui, I like the sound of these. I’ve only read one Capote – Breakfast at Tiffany’s – but I do have more on the shelf for some point! Thanks, Naomi. I think you’d like these stories. Tiffany’s is on my reread list – I’m pretty sure I read it many years ago, one to revisit. I have to read In Cold Blood as another friend recommend it to me last year. Have you seen the Capote film, the one with Philip Seymour Hoffman? It looks at the research he did for that book and his meetings with the men convicted of the murders. If not, it’s definitely worth a look. Yes, I agree. I don’t know how I managed to miss it at the cinema as Hoffman and Christine Keener are two of my favourite actors. Just caught up with the DVD over Christmas. Thanks, Karen. In Cold Blood is on my list for sure and I’m glad to hear you rate it. The process of blogging/reviewing is definitely helping me to remember books much more effectively than before…my early reading years are a black hole! I must try to find time for this book — your descriptions are tantalizing! The only Capote I’ve read is In Cold Blood, and that was decades ago, probably not long after it came out. I did, however, watch all four of the In Cold Blood-related movies (the original, the TV miniseries, Capote and Infamous) a few months ago, and found each of them excellent in its own different way. Cheers, John. If you’re interested in Capote as a writer and an individual, then I’d say these stories are worth a few hours of your time. Three or four of the stories feel inspired by aspects of his childhood giving an insight into his early life. I must read In Cold Blood as so many people have mentioned it to me. As I think you know, I watched the Bennett Miller/Hoffman Capote film over the holidays, and Infamous will make an interesting companion piece I’m sure. I’ll take a look at your website for reviews of the adaptations of In Cold Blood, too. Thanks for dropping by. I like short stories a lot as a break in between weightier novels. I’ve never been curious about Capote as a writer for some reason–although I am curious about him as a person. I was a bit put off, to be honest, about him when I read Mockingbird–a non fiction book about Harper Lee. She literally grew up next door to Capote. There was some controversy about whether or not she wrote To Kill a Mockingbird or if Capote wrote it (she was an unknown, he was a rockstar). But it’s clear it was Harper Lee’s book as she done so many revisions. That’s one of the reasons why I like short stories too. I didn’t know very much about Capote till I read this collection. The introduction was quite helpful in shedding some light on his early life, how the experiences of his formative years may have coloured some of these stories. That’s interesting about Harper Lee. In fact, I hadn’t realised he was so close to her till I watched the Capote film and there she was accompanying him during his research on the Kansas case. It was around the time of Mockingbird’s publication although the film only touches on it briefly. Going back to Capote’s stories for a moment, I think you might like some of the city-based ones (if you were ever minded to try any): Master Misery and Miriam, for instance. The Dylan Thomas is another favourite, ideal for reading aloud. 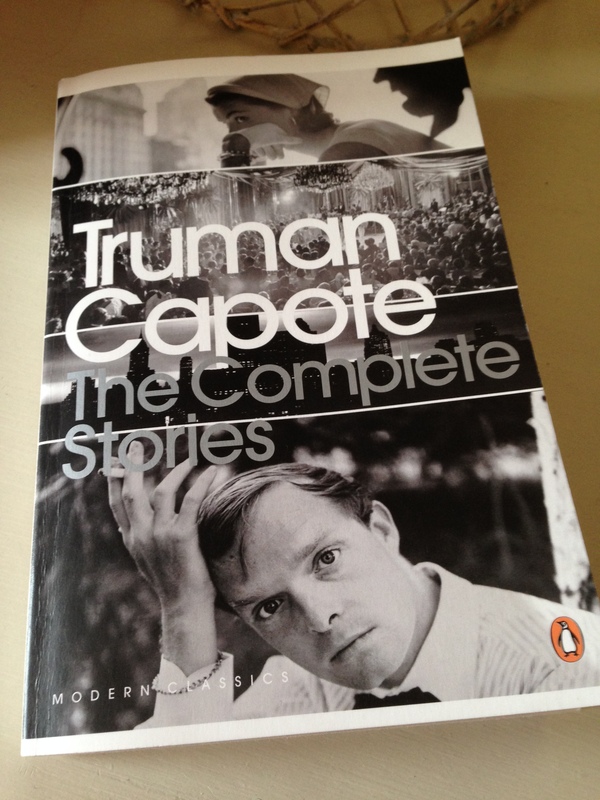 I’ve looked for an excuse to read Truman Capote, and the com plete stories may be it. ‘In Cold Bloomk which is non-fiction might also be worth reading. I’d recommend them, and they’re good for dipping into. In Cold Blood is on my list as so many people have recommended it to me. Well done, you’re getting into that #TBR20 pile, sounds like a good collection, I enjoyed reading the many reviews last year of some of his lesser known works. Capote’s stories are good, Claire, and it’s nice to dip in and out of a collection like this. Yes, I’m getting through the #TBR20. I started back in December so I’m currently reading book #7 with #6 (Knausgaard’s A Death in the Family) on hold. I just need to catch up with the backlog of reviews from last year. Oh, and I’ve also read a Pascal Garnier review copy plus a library loan both of which I’m excluding from the twenty just to avoid cheating. I’ve only read the typical In Cold Blood by Capote, and have yet to read the wonderful collection of short stories you recommended, and I bought, in the Fall! Jacqui, there’s not enough time for me to read all I want!! I shall have to read In Cold Blood as it keeps coming up in the comments. The other short-story collection you bought on my recommendation: that’s Edith Pearlman’s Binocular Vision, right? I hope you enjoy it. And no, there’s never enough time for all the books! As you know by now, US literature is not my strong point so it won’t surprise you to learn I’ve not read any Capote. I wasn’t really aware of him as a short story writer. I love the sound of A Christmas Memory in particular – one to save for next Christmas perhaps! I might join you in another American literature month at some stage! I knew he’d written quite a few short stories but I’d only ever read Breakfast at Tiffany’s, and that was several years ago. A Christmas Memory is wonderful, and I can see it becoming a favourite reread…worth tracking down. Lovely review Jacqui, you’ve made me want to reread them as it’s been so long! I do love A Christmas Memory. Oh, that’s good to hear – thanks, Cathy. I loved A Christmas Memory and I’m sure I’ll be revisiting it next Christmas. It’s such a visual story too, easy to imagine the scenes in your mind’s eye.